So you guys really think Nina is more likely to end up off Peru than Australia? I give up. I sure hope the families aren't listening to you. I'll be happy if they end up in Oz, because that will mean they are still able to sail their boat. It also means they are just slow and don't need rescued. If they are adrift there is a small chance that they are washed up on some desolate shoreline on the North Island of NZ. If they missed NZ they are most certainly on their way to Peru, but because of the Humboldt they'll never reach it. Mark and I have explained why we think they are east. I have yet to see anyone give a physical explanation of how they could end up west, assuming they are disabled and adrift either in the boat or in a raft. I would be happy to hear one if someone can come up with one. I will not accept examples of boats lost further north at the beginning of summer as proof. I want someone to explain how winds and currents could set them west at this time of year. I'm open to any explanation that is based on physical reality. The middle of the Coral sea. It goes West. Till you guys go back and look at HISTORICAL DATA and not THEORETICAL data you are making yourselves look silly. I am sorry to inform you that Bill and I are correct... as are the pilot charts. Yes you will find eddies that go the other way, but generally there aint nuffin thaat goes from NZ to Australia. I fail to see any current that could have pushed Nina east of NZ. The maps you show are crude generalizations and are also currents at depth, not the surface. You can click "uv" for a wide area and then click on any date. Also as I said previously, the currents in the Tasman are much less in the winter. The real time data shows this. The currents in the middle of the Tasman are variable and about .25 m/s which is less than half a knot. The currents go in all directions with many eddies. Compare it to the summer if you want and you will see the currents are much stronger then. Please show me the current or wind that could have pushed Nina east of NZ using the real time data. yep...every airline pilot I know looks up wind patterns from historical data...asking the tower what the winds are NOW for takeodff would be silly. Although Pilot Charts do not necessarily represent current conditions; they ARE precisely Historical Data. OK ya got me on semantics...I meant till you use the weather and current data DURING THE TIME PERIOD of the SAR mission....then it's a crap shoot on how accurate your guess is. Pilot charts are using decades or centuries of averages...not what was happening at the time people may have been drifting. Surface current can be as much as 100% opposite as a prevailing current when the wind blows strong. Predicting drift is altered greatly using realtime data. Ok, I had a look at the real time current data. I saw nothing in it that would indicate a westward movement to a drifting object. Except in a couple of eddies the currents have an easterly component. They would actually be lucky if they got caught in an eddy as it would slow their easterly progress. There seems to be a strong and persistant eddy near their last reported position. It is possible that a floating object could get trapped in it. If they didn't get trapped in that eddy then they are most certainly east of their last position. 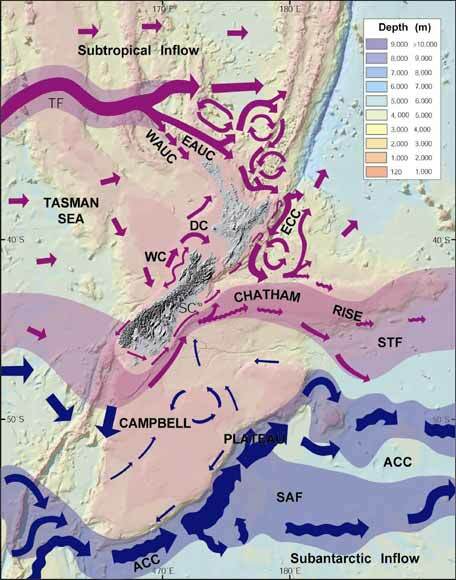 If they are not in that eddy and they have missed the NZ coast then they are on their way to SA. My actual opinion is that there is only a very small chance they are still alive, but on that small chance the logical place to look is east, but I would rule out the eddy first just because it is a much smaller place to search. Very good post. Do not assume though that many people will read in. The point is most will just glide over, esp. those that think they know better. Rejecting prior to reading is common these days and is not limited to clergy. You can post relevant data over and over again but you will drown in the ocean of chatter, noise and uneducated misunderstandings. Good try. I owe you a beer and it is not the first one. Not to say they aren't good info to a point and that all these SAR threads are full of opinions that wouldn't find a fly in a cocktail glass. What's the purpose. The sea took them , what's so hard to understand. East west ? North South ? How about down ? The fact is if there is any flotsam from Nina it could be anywhere in the southern hemisphere. It's all very sad, but maybe a lesson to be learned. No problem. Never applied. With me, you see, it is the other way round: I elect with whom and for whom I work. I too am sad with the news and, like some others, hope Niña and her crew will get to somewhere or get found. I know such stories do happen. It is only that with every passing day, their chances seem slimmer.